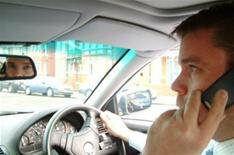 Drivers still flouting mobile phone laws | What Car? A What Car? survey has revealed that 36% of motorists still admit to using a handheld mobile phone while driving their car, with a quarter saying they've done so in the past week. However, the true figure could be much higher because 93% of motorists say they've seen someone else using a mobile phone at the wheel in the past seven days. In spite of tougher penalties being introduced in 2007, which include the threat of jail if a driver is prosecuted for dangerous driving, there has been no drop in the number admitting to using a handheld mobile over the past year. Last year's survey also showed that 36% admit to using their phone while driving. Only a slight drop of 6% has been recorded since 2005. Steve Fowler, What Car? editor, commented: 'The message is obviously not getting through if you use a handheld mobile phone while driving, you may end up killing yourself or others. When did you last use a handheld mobile phone as you drove? When did you last see another motorist using a handheld mobile phone?